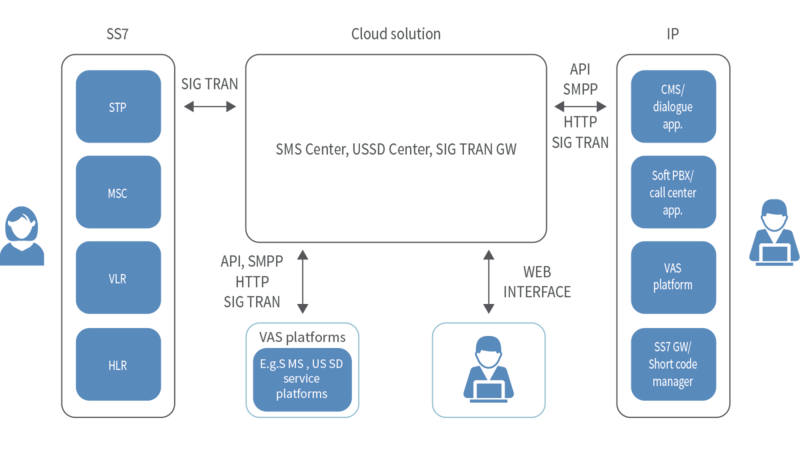 A Cloud Solution is an SMS Center, USSD Center or SIGTRAN Signaling Gateway with redundant hardware that is hosted in a secure data center with a powerful internet connection. Players in the ICT industry can use the hosted platform to utilize the potential of agreements and new business opportunities without having to care about hardware and hosting. This enables the customers to generate new business opportunities and revenue streams while keeping focus on their core competencies and core business. The solution consists of redundant software installed on two servers with a Hot Spare redundant solution with E1 load sharing. The solution is hosted in a safe data center with power and a powerful internet connection. The available products for the platform is SMS Center, USSD Center, SIGTRAN Signaling Gateway. The products have full SS7 interfaces and rich rich IP interfaces and advanced facilities including routing. The administration interface is web based. Standard operations support is included in the platform. Optional services that releases the customer for more tasks in relation to operation of the solution.